For Tom Szaky, it started with a dream, the environmentalist itch, and a little weed. Fast-forward to a decade later, and it’s clear that Szaky (silent ‘s’) has come a long way. As a Princeton University freshman in 2001, Szarky was shocked at how much waste he saw on the Ivy League campus. Not just the lack of recycling opportunities, but also the waste of food in cafeterias and the overall loss of resources. That, combined with a fall break trip to Montreal where he learned about using worm compost to grow better marijuana, and an idea was born.me a long way. In other words, you send them your trash; they make it something worth using. 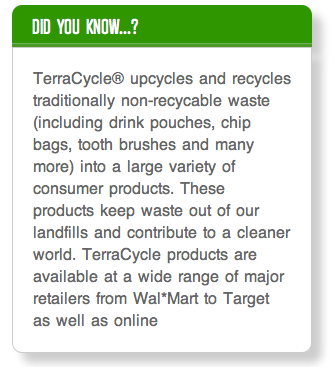 Obviously not all your trash—but before you throw away that M&M wrapper, it’s worth checking out their site. The idea behind the company is making environmentalism profitable for big business. Terracycle is essentially trying to sell the idea that an eco-business can be profitable—and it’s what people want. Once the big companies start seeing a demand for green-friendly goods, those companies will start stocking more of those goods. You might be wondering, does the company practice what they preach? Well, yes. Tom Szaky’s favorite product is the Capri Sun Messenger bag. There’s nothing quite like walking into an important meeting with billionaire investors with a recycled workbag.